Hot tub and swim spa specialist distributor Catalina Spas has followed up its launch of the new Dream 600L hot tub model by declaring that the reaction from the British market has been ‘amazing’. This year Salisbury-based Catalina Spas has lined up a bumper batch of feature-rich product launches for UK-based dealers to target the thriving wet leisure market and Managing Director Stephen Crabb has reported that the new Dream 600L, pictured, has immediately received a hot reception from holiday rental companies and prospective dealers. “The initial response for our new Dream 600L model has been amazing, especially with the holiday rental companies,” said a delighted Stephen. 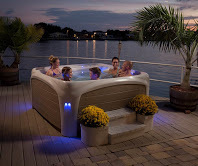 Manufactured by Dream Maker Spas in Florida the new six-seater Dream 600L comes in at 203cm x 203cm x 91cm with a hydrotherapy lounger seat and is being exclusively distributed in the UK by Catalina Spas with the promotion of it being the ‘most innovative hot tub for 2016’ due to the fact that it incorporates a specialist production process that uses Linea High Density Polyethylene (LHDP). “This unique spa breaks the mould of traditional spa design and construction,” declared Stephen. “There is literally nothing on the market today that compares to it. And nothing that gives you anywhere near as much spa for the money. “Dream Maker have created a totally unique spa that is nothing like any rotationally moulded spas that have come before it. The 600L has a state of the art Pearlglaze finish that combines the benefits of both rotational moulded and acrylic spas. “The 600L is lightweight, durable and less expensive to manufacture than an acrylic spa, yet is smooth to the touch with a polished metallic appearance just like acrylic. The smooth surface is achieved by using advanced LHDP incorporating a special ‘mica’ fill package that produces a ‘metallic’ appearance. “It has a very high strength-to-density ratio and is used in the production of canoes, outdoor furniture and leisure craft yet strong enough to be also made into traffic cones and fuel storage vessels. This unique material and the one piece construction means the 600L is virtually indestructible and also widely recyclable, unlike any acrylic spa. “This truly is a spa that will impress in any showroom setting. Placed next to any other brand of rotationally moulded hot tub the Dream 600L looks a world away from the old dated designs. “Equally, placed in a showroom full of the finest quality spas in the world it holds its own. The external design is contemporary with flowing curves, arched wood effect panels that make the dream 600L look like it is standing on four supports.